If you’re anything like me as soon as the spring thaw takes over you start thinking about camping season. Before you get your gear together and strap a pack to your back, there are some important considerations that are best taken care of sooner than later. Something I started doing years ago was keeping all my camping gear in a bin that I store in the garage. That way I don’t have to search for pieces of gear when it’s time for a trip and for another I’m always prepared. You never know when a friend might suggest a camping trip or you might have to hit the road for an unexpected reason. Having a go-box, so to speak, is essential for a proper adventurer. These days so many people are enjoying the outdoors that the prime spots are often overcrowded. For this reason if you’re planning to reserve a campsite, do so as early as possible. Some of the most popular campsites or rental campus will be reserved almost the instant they are available even if that’s up to a year in advance. Even if it’s not a campsite, if you are a back-country camper you may still need a forest pass and often a parking pass as well. Wherever you are going start by calling the nearest ranger station. For those back-country explorers especially, but for anyone else as well, you should research as much as possible. Read reviews of the campsite and seek out first person accounts from those who made the trip before you. Searching social media like Twitter and Instagram for posts and photos from the location you plan to visit will also give you a good idea of the terrain. Get a sense of the weather and what type of clothing is most appropriate. You’ve got your gear together and you’ve researched the necessary permits and reservations you need to explore the region. Unless you’re planning on sitting in a lounge chair drinking beer all weekend — not that there’s anything wrong with that — you’re going to want to be physically prepared for the journey. Back-country hiking with a heavy pack is one of the most strenuous activities out there. Best to do some physical exercise before jumping onto the trail during camping season. One thing that I think about each camping season is how to lighten my pack even further. Think again about what you’re taking with you on the trail. Are any of these items expendable? If so, get rid of them. Chances are most of us are still camping with way too much gear. The point of going out into nature is to return to our primitive selves in a way, which can’t be done if we’re constantly fumbling with various gadgets. 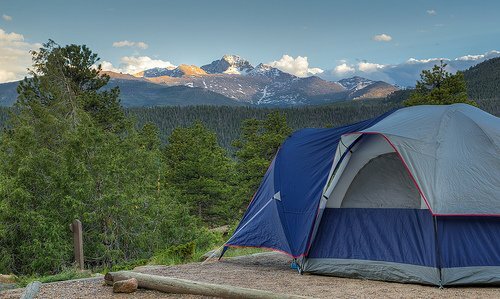 So think about ways to lighten your load as you prepare for camping season this year. Something else to always have on the back burner, so to speak, is your food choices during a camping trip. Think about what you brought last time and how it worked out. Maybe those breakfast burritos weren’t as bomb as you thought they were and you really could have just gone for some peanut butter and jelly. Maybe try out some new dehydrated food options. Better to find out you don’t like something when you’re at home than 20 miles from the nearest anything.